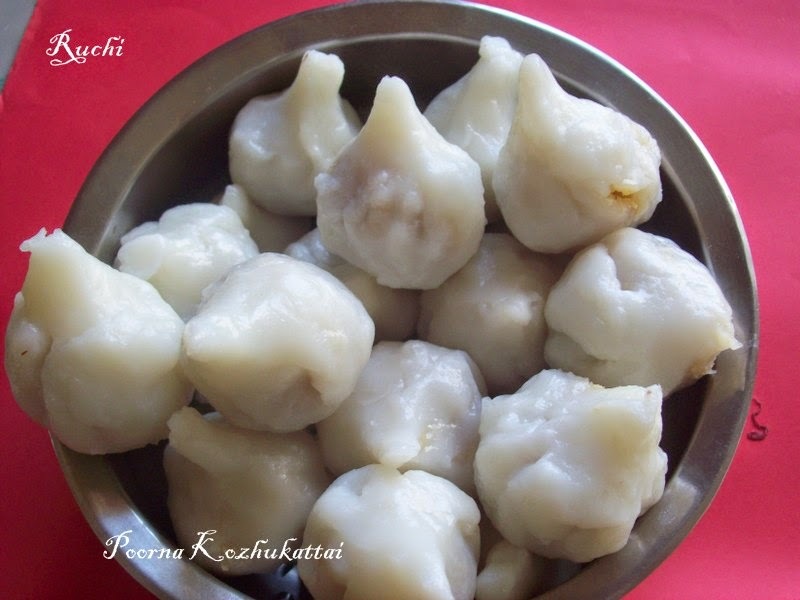 On this festive day we offer Mothagam / Kozhukattai for our Pillayar/Lord Ganesha.I make Kozhukattai on, Sankatahara Chaturthi/ Sankashti, Amavasai,If any wish fulfilled I immediately Prepare Kozhukattai. 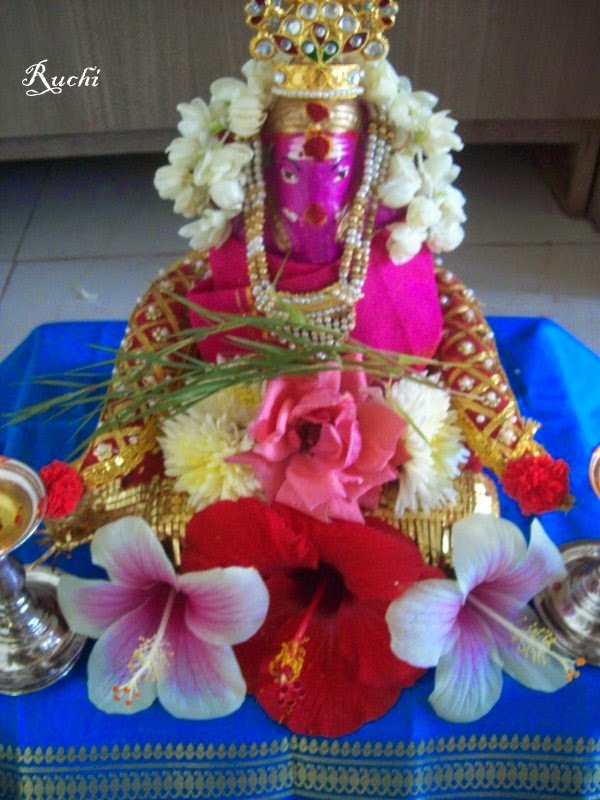 On Vinayagar chathurthi day meant preparing poornam kozhukattais and ulundu kozhukattais were the only two offerings prepared Apart from the kozhukattais We usually prepare Payasam, Appam , Ulundhu Vada, Sundal, Raw rice Idly as Neividhyam. 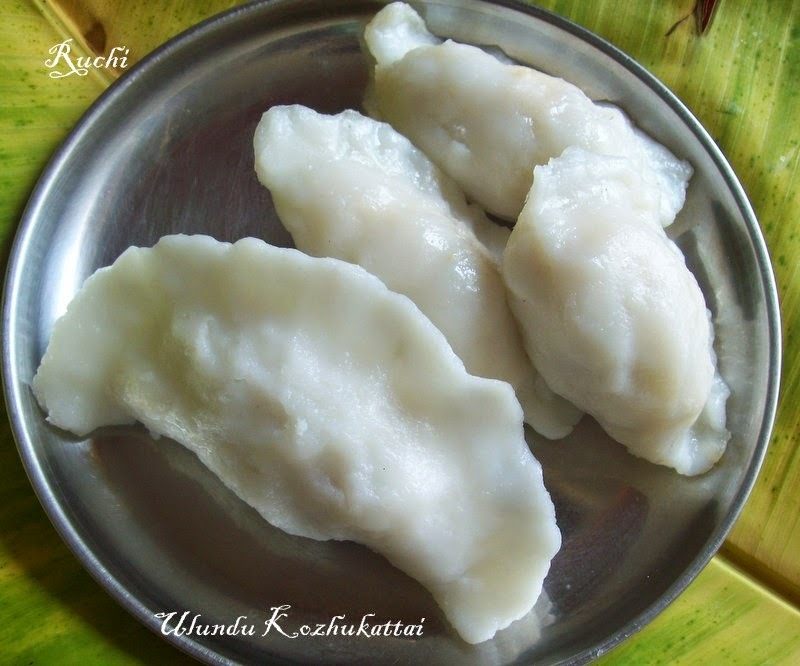 I always Prepare Kozhukattai using rice batter Sweet & Savory version of modak, and in tamil, it is kwon as Vella kozhukattai (sweet version) & Uppu Kozhukattai (savory version). So here goes the recipe of Mothak / Steamed Rice dumpling filled with sweetened coconut stuffing ..
1.Soak rice for at least 1 to 2 hours. Then grind it to a very smooth batter by adding 2 cups of water. 3.Slowly the batter will start thickening, mix well continuously so that no lumps are formed. 4.Once the dough is well cooked, if you touch the dough, it shouldn't be sticky or can be easily made into balls without sticking to your hands. Remove from fire and keep it covered. 5.Once cool enough to handle take little portion of the dough and knead well with oil-greased hands or with wet hands to form a soft smooth dough. Note: Keep the dough covered all the time. As the out layer can dry up quickly. 1.Heat pan add water, then add jiggery,When the jaggery dissolves completely in water, strain it to remove impurities. 3.Add ghee to it and mix well. Allow it to cool completely. Then make Small balls out if it and keep it aside. The sweet filling / Thengai Pooranam is ready. 1.Grease hands with oil, now take a dough ball ( small size ball ), and start flattening it with your fingers around the sides, and continue towards the centre of the ball, so that it forms a cup shape with all sides of the same thickness. 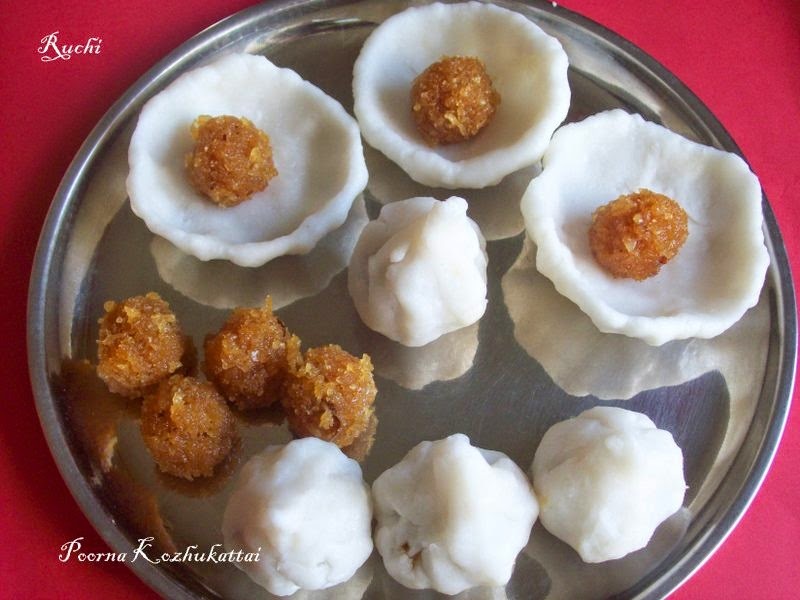 2.Place the sweet filling ( Pooranam) in the centre, and slowly gather all the edges of the cup together and Close the sides of kozhukattai mavu gently in all the sides. 4.Repeat the same process for the rest of the dough and pooranam. 5.Steam for about 10 to 12 minutes. You will see a glossy coating over the modak / Kozhukattai when it is done. Allow it to cool completely and transfer it to a container. The savory version of kozhukattai , which is made by stuffing urad dal poornam, made for ganesha chaturthi. Note: For Outer covering As said above..
1. Wash and soak the urad dal for 20 minutes. Discard the water, and rinse in fresh water again. Drain completely. 2. Grind this along with green chillies and curry leaves into a very coarse paste, without adding any water. 3. Transfer into a bowl, add salt and mix well.Make small balls out of the batter and press it to small patties shape. Grease oil in idly plate and arrange the patties..
4. Heat oil in a fry pan.. Add mustard seeds, let it crackle and add split urad dal, , hing and curry leaves. 6.Set aside to cool slightly by covering it with a damp cloth. Knead it to soft dough, once the dough is still warm..
7.Grease your palms and pinch out small lemon sized balls out of the dough. Now pat it slightly thin. Shape into small oblong shaped balls. 8. Place 2 tsp of prepared filling in the centre.And fold it to half of crescent shape and seal the edges. 9.Repeat this until the entire dough finishes.Place the kozhukattais one by one in the greased idly plate. My name is Phuong, currently working for foodpanda India with Food Delivery Service via website: www.foodpanda.in. I would like to take this possibility to introduce foodpanda to you and hope to cooperate with you.